It may be difficult today to visualise the occurrence of black rhinoceros, elephant, buffalo, giraffe and lion in the Kuiseb Delta near Walvis Bay, but signs of their passage still exist in the form of tracks in silt deposits, several centuries old. These muddy tracks corroborate strange stories about rhino, written by European explorers. How did they manage to live there, and how did they disappear? 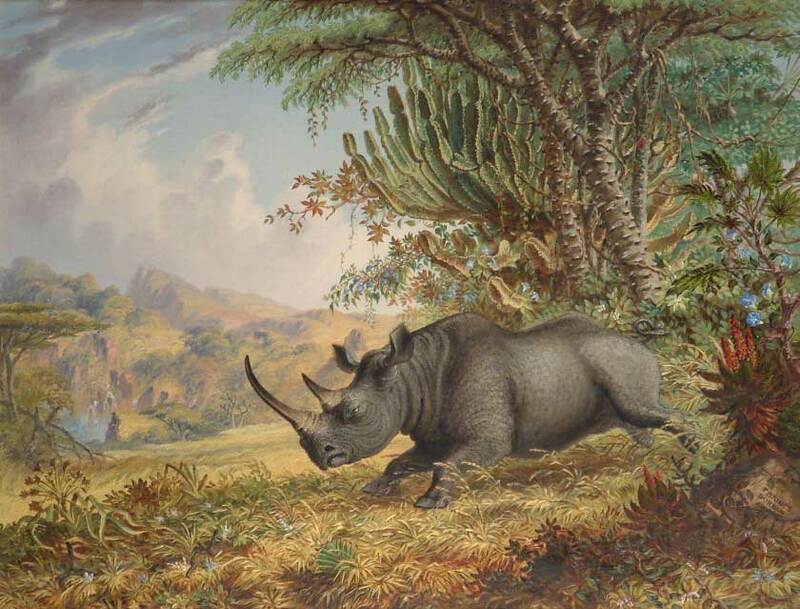 In his travel report of 1837 entitled An expedition of discovery into the interior of Africa through the hitherto undescribed countries of the Great Namaquas, Boschmans, and Hill Damaras, Sir James Edward Alexander expounds on his fascination for black rhino, which he describes as powerful behemoths. Alexander approached the coast from the Namibian interior through the Naukluft Mountains, using the route through Büllsport. He and his travelling party killed and ate two rhinos in the Naukluft before embarking on the arduous and almost disastrous trek across the dunes to the Kuiseb Canyon. There Alexander found the carcase of a rhino, presumed to have drowned in an earlier flash flood that had thundered through the canyon. 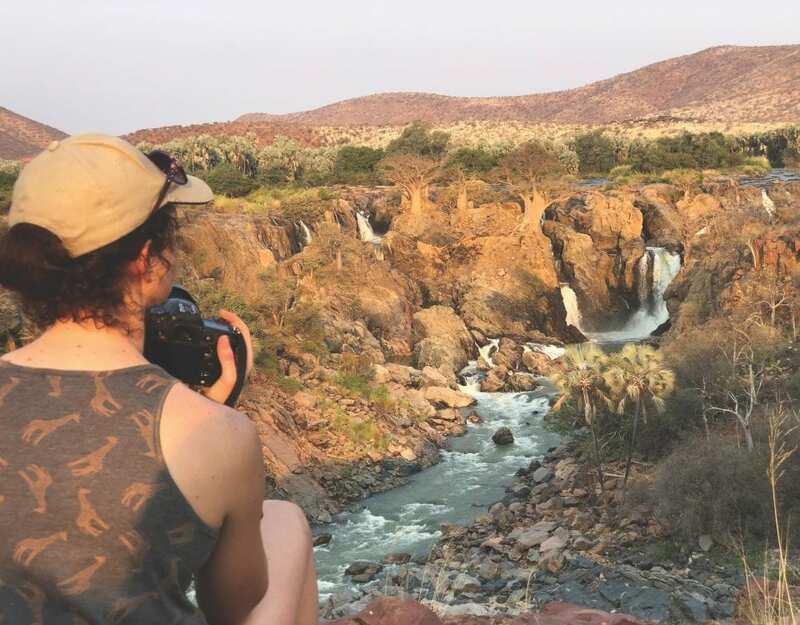 Weeks later, further upstream, Alexander encountered a rhino cow and calf, not far from where the Kuiseb Bridge is located today, a further indication of a resident population in the interior. 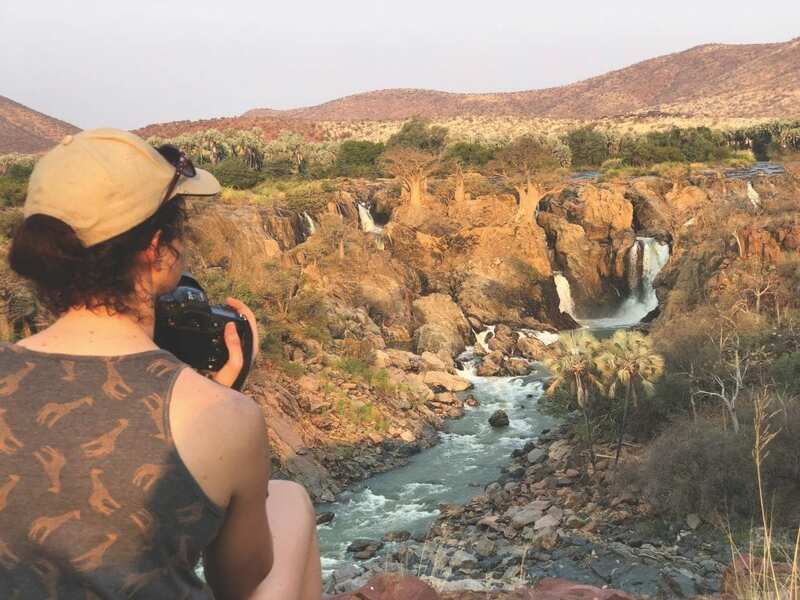 It is plausible that the richly vegetated Kuiseb River provided a connection for the rhino population to extend downstream. Indeed, a rhino cow and calf were found by Missionary Heinrich Scheppmann at the Swartbankberg, 40 km from the coast. Kuiseb Delta by Paul van Schalkwyk. At Walvis Bay, the chief of the Topnaar told Alexander about rhinos living nearby. There is also the earlier (1793) account by the captain of the Meermin that the ship’s crew had killed a rhino at Walvis Bay. Thus, at least until that point in time, there was a breeding rhino population in the Kuiseb, extending to the river mouth. In those days, bulky rhinos represented good provisions for travellers and their grand entourages, and such substantial dinners deserved a mention in travellers’ diaries, all the more so because of the hunter’s prowess to garnish the travelogues. Narratives of famous explorers James Chapman, Francis Galpin and Charles Andersson in the mid-1800s reveal this only too plainly, as does the lucid artwork of Thomas Baines. All of them travelled through Walvis Bay, and Galpin shot a lion in the vicinity, but none of the reports says anything about rhinos at the coast, their accounts relating only to the interior. Perhaps, by this time, the local rhino population had already been decimated in the close environs of the harbour. By 1889, at least, they seem to have disappeared. This was the first time their tracks were mentioned, probably because that is all that was left. So, while we are delighted to have evidence of the past occurrence of rhinos, these, sadly, only too clearly, also document one of the main causes of their demise. While rhinos no longer occur anywhere near Walvis Bay, their tracks still do. The Kuiseb Delta, as we know it, is quite a different habitat than any area where rhinos live today. How did rhino exist there? The easy answer is that we will never know for sure, as we cannot observe them. But we do know a little bit about the past conditions prevailing in this area, because of what the travellers wrote, namely that the environment in this part of the world was different then. 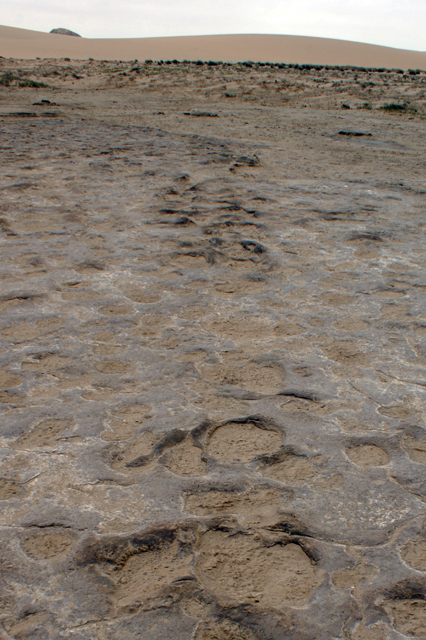 Ancient rhino tracks in fossilised mud in the Kuiseb Delta, Joh Henschel. It is abundantly clear that there was much more fresh water available at the surface before bulk-water abstraction for urban and industrial use lowered the groundwater level. Furthermore, the Kuiseb floods had not yet been brought under control by damming upstream and flood diversion downstream, and the shallow groundwater was thus more regularly replenished. Small sand dunes that moved into the area were occasionally flushed away by high floods, and the Kuiseb Delta was less smothered with sand than it is today. There was more vegetation and a higher diversity of plants, as well as a range of large mammals that no longer occur in the area. Back then, the area south-east of the Walvis Bay Lagoon appeared to have been a thriving freshwater wetland, with a rich community of plants and animals. For rhino, the occurrence of surface water was important, as they needed to drink. During dry periods, water pools were probably kept open by various animals digging. There would have been a good number of palatable plants for rhino to choose from, and although they don’t eat everything, they are not particularly picky – the rhino palate loves variety and a couple of thorny, chewy or chemical challenges. It is thus quite plausible that rhinos lived at the coast. Indeed, their footprints tell the tale. The demise of the behemoth, to use Alexander’s expression, was a double whammy, not only in the Walvis Bay surroundings, but in many parts of Africa. People armed with powerful technology and overpowering development goals, came, saw and conquered the behemoth as well as its environment. It is important to conserve the telltale tracks of rhino, as they are the reminder of what once was and now is lost. It is also our loss. Fortunately, there are still healthy populations of black rhino living in north-western and other parts of Namibia. It is imperative that we keep them and their environment viable. This article appeared in the Autumn 2012 edition of Travel News Namibia. Who was Francis Galpin ? Never heard of such?